For Captain Maddox, it will be the strangest mission of a long and hard war. Not killing Hitler…but saving him. Poor health has forced Maddox into retirement after a series missions that would have finished off lesser men. He thinks his war is over. Then Major Lyle turns up at his door with one last job. The Allies want to capture one of Hitler’s many doubles – a man who he believes possesses vital information that could shorten the war. But why do they need Maddox for this strike? After assembling a joint British-American team, they plan to attack the Nazi fort where the man they need is located. But Maddox can sense something is wrong. Nothing goes the way it was planned. It appears that Lyle has a secret agenda. And Maddox is plunged into one of the War’s darkest episodes – where friends become enemies and enemies friends. 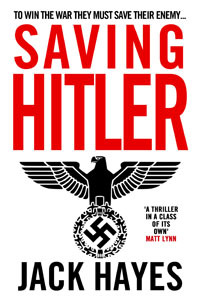 'Saving Hitler' is the full-throttle WWII adventure sequel to the best-selling 'Blood Red Sea'. It is perfect for fans of Jack Higgins and Alistair MacLean.